Live! By Loews – St. Louis, MO, the $65 million hotel project, will bring an upscale hospitality experience to downtown St. Louis. Located directly across from Busch Stadium at the intersection of Clark and 8th Streets, Live! 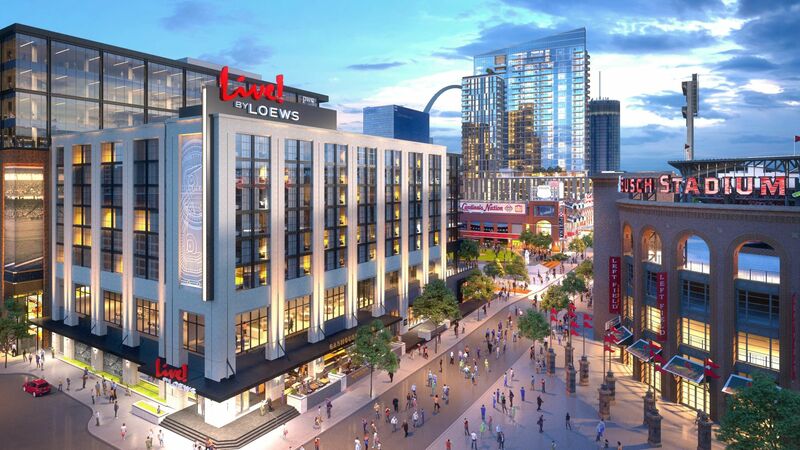 by Loews – St. Louis, MO will be a celebration of the rich history of St. Louis, a spectacular destination for sports fans, families, and visitors, as well as a premier location for meetings and special events. The 8-story hotel tower is part of a dynamic plan to complete a full build-out of Clark Street, transforming it into one of the most unique city streets in all of professional sports. The 700,000 square foot second phase of Ballpark Village being developed in partnership between the St. Louis Cardinals and The Cordish Companies will feature a 29-story luxury high-rise apartment tower, the first Class-A office building built in downtown St. Louis in nearly thirty years, an upscale, full-service Live! by Loews convention hotel, as well as additional retail and entertainment. Just as the first phase of Ballpark Village created more than 1,000 construction jobs and 1,700 permanent new jobs when it opened, the second phase of Ballpark Village stands to create 1,500 construction jobs and more than 1,000 permanent new jobs. Plans call for construction to get underway by the end of this year.